A hearty soup is perfect in weather like we’ve had in the last few days. It’s comforting, warming and easy – a thick soup is a whole meal in a pot. 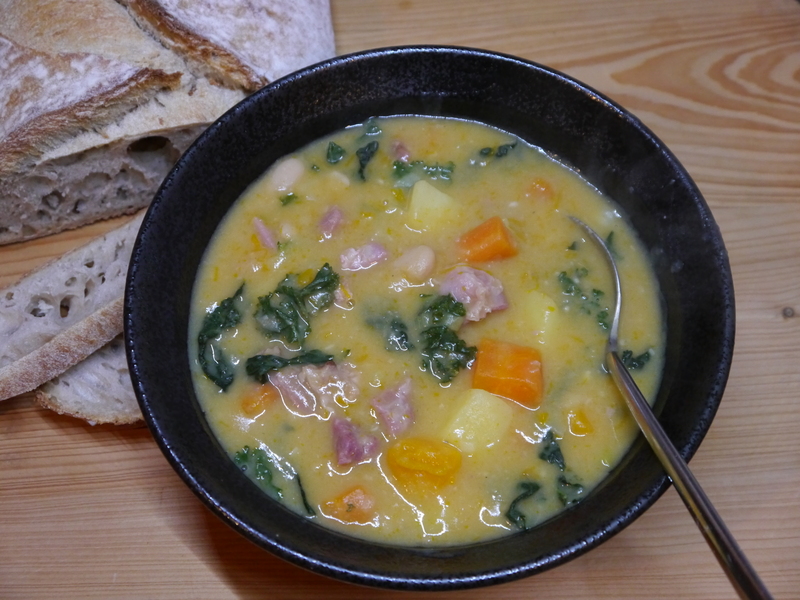 Everyone loves pea and ham soup but I decided to do something a little different – change the split peas to cannellini beans and add some other vegetables. I took the easy way out with the beans and bought tinned ones rather than do the soaking and cooking myself. I made a very large pot – so add as many or as few other vegetables as you like and change the quantities around. Place the hocks in a large pot and cover with cold water. Bring to the boil, skim any foam and then add the carrot, onion, celery and bay leaves. Gently simmer for at least an hour or until the meat is coming away from the bones and feels soft. Add 4 tins of cannellini beans. Simmer for another 5 minutes or so. Take off the heat, remove and set aside the ham hocks until they are cool enough to handle. Take out the bay leaves. Using a hand-held blender stick, blend the remaining ingredients in the pot till smooth. Return the pot to the stove. Bring to the boil, skim any foam and add the crushed garlic, pumpkin, carrot, potato and leeks. Gently cook till the vegetables are just soft. While the vegetables are cooking remove the skin and fat from the hocks and cut the remaining hock meat into small cubes or shred it. Finally add the ham pieces, beans, cavolo nero and kale to the pot. Cook for another 4-5 minutes. Season with pepper. Serve with fresh crusty sourdough bread or, if you like, toast the sourdough, drizzle with olive oil and rub with a cut clove of garlic.